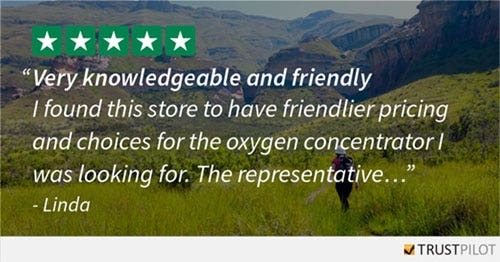 We know that our success depends on the satisfaction of our oxygen customers and that is why we strive to give every customer the highest shopping experience! 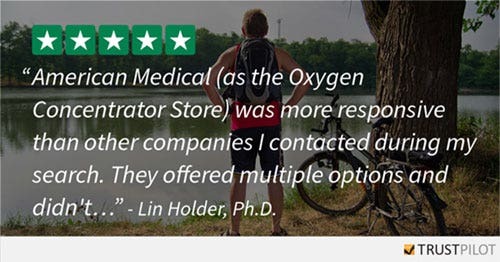 We pride ourselves on educating new customers on oxygen solutions and providing post-shopping customer support. We currently hold a 5 Star Customer satisfaction rating from Trustpilot.com, ShopperApproved.com and an A+ Rating from the Better Business Bureau. We have served 10000s of customers since 2001 and we look forward to adding you to our list of satisfied customers. We encourage you to contact us via telephone at 1-877.774.9271, live chat or e-mail anytime if you have any questions. While we have grown to one of the top medical supply web sites, we have not lost the customer service that has made us so successful.